Ok, I know I shouldn’t generalise things like that. I will stick to my case: Hiring is hard in Kanpur. Do you know I moved back to this city ten years back? I guess it was April 30 or May 1 2008. I can’t even find good HTML/CSS guys here. Or am I failing to reach out and connect to them? Got any better ideas, I am all ears. I tend to hire people who would value working in Kanpur. For example, someone pursuing B.A, or B.Sc. degree, or someone who has strong reasons to be in Kanpur. I am trying to be patient while they spend ages to learn things. Patience is virtue. This entry was posted in Entrepreneurship, General, India, Kanpur and tagged challenges, Entrepreneurship, hiring, India, kanpur on April 30, 2018 by Abdul Qabiz. NodeSchool is a fully community driven effort and is 100% open source. This means that anyone can use the NodeSchool materials and/or host an event. I have set up NodeSchool Kanpur chapter, and I hope to organise (with help of like minded people) a couple of workshops on Node.js (and web-development ecosystem around it). I am looking for mentors and co-organisers, if you are interested, let’s have a conversion. This entry was posted in General, India, Kanpur, Node.js, Open Source, Programming, Web Development and tagged kanpur, node.js, nodeschool, opensource, workshops on February 19, 2015 by Abdul Qabiz. Netflix is not accessible in India due to licensing and other reasons. A lot of people (including expats) want to access Netflix, Hulu and other services in India (or other geo-blocked or geo-fenced territories). Thanks to Unotelly for their DNS/VPN service which enables watching/consuming geo-blocked content including Netflix’s. I have used Unotelly for couple of years. Trust me, it is convenient and better use of time to go for Unotelly when you really want to watch some shows and films. Wondering, why couldn’t I build my own system to do that? Just so you know, as a geek, I have successfully set up and run my own VPS (with SNI/non-SNI DNS Proxy and VPN), but not everyone can or prefers to do that. The goal was to watch some shows and films, but I got drifted away while building my own system, and ended up spending a lot of time (and money – vps fee) in setting things up than watching shows/films. I think, Netflix would be officially launched in India in couple of years. For those who can’t wait, why not use Unotelly? This entry was posted in India, Kanpur, Software Reviews and tagged dns, geoblocking, hulu, India, netflix, premium content, proxy, sni, unotelly, vps on February 18, 2015 by Abdul Qabiz. 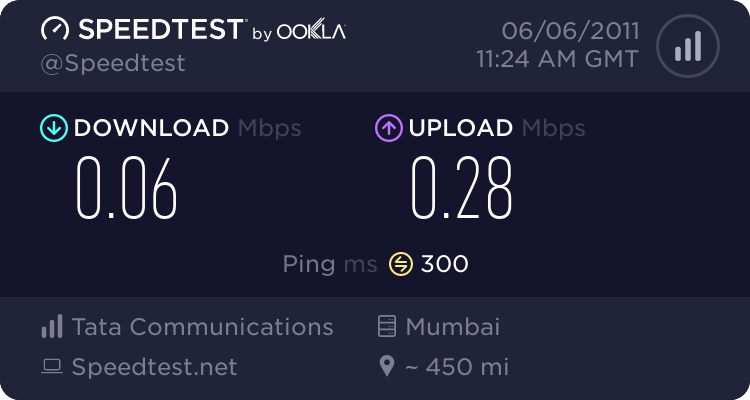 I got Tata Photon+ mobile broadband connection during 2010, it worked well initially for a month or two.I can notice, their services have been degrading since then (late 2010). Connectivity is not an issue, but download speed and latency. We all know, most of marketing/advertisements campaigns are big lies. There is big disconnect between the idea/dream they show and the reality. 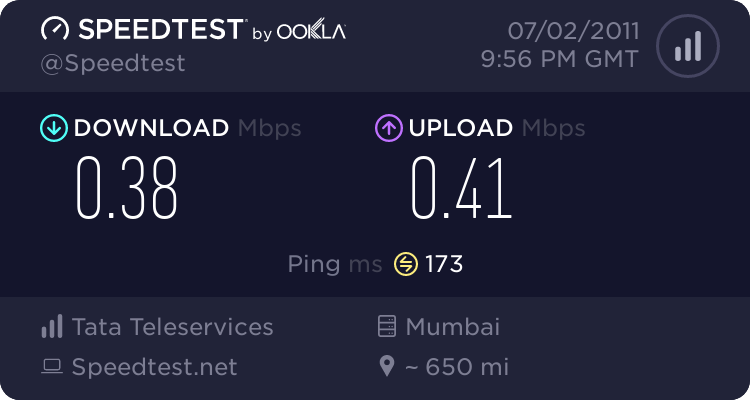 In the case of Tata Photon+, they advertise about giving ‘up to 3.1 mbps’ download speed BUT I am yet to get 1 mbps consistently for an hour, leave alone days. I guess, this is location specific. Places like Kanpur and other cities in UPE are not given enough of importance (network infrastructure and attention)? 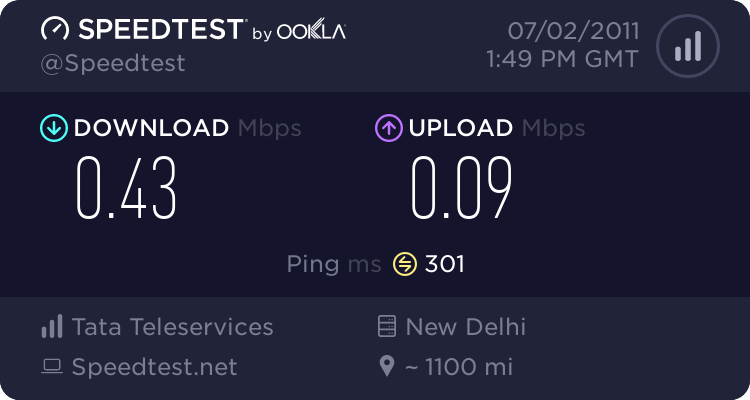 Whenever I complain to Tata Photon Customer Support, someone visits, tests using speedtest.net against Delhi/Mumbai servers, and shows me test results (skewed?) which is generally in range of 600 kbps to 1.2 mbps. Yesterday, I filed another complaint over phone. I got a call asking if I was in front of computer, I said “No, but I would be in couple of hours and tomorrow”. After couple of hours, I got a SMS suggesting my complaint-ticket had been resolved and marked as closed. Really? No one visited me. I filed another complaint using web-site, got around 10+ calls within 12 hours. All of them asking same question “What’s problem sir”. I don’t understand, why didn’t these guys look at their CRM and read the details (which included the speedtest.net test results)? Anyway, one of those guys (from some Tata hired agency) visited me today. 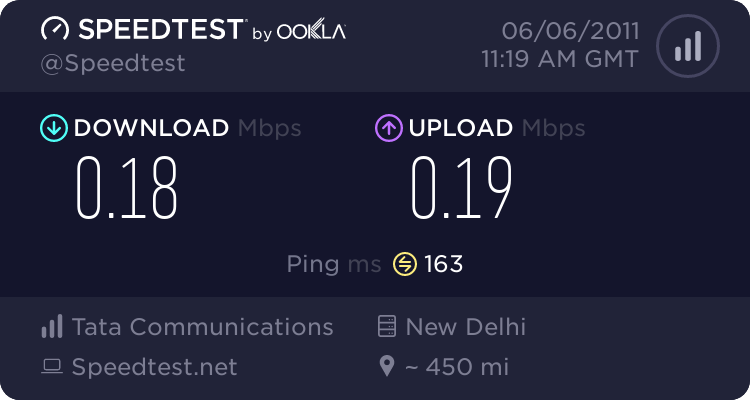 He repeated the same process of testing against two Indian servers using speedtest.net. This time, he got lucky speed results showed around 1 mbps agaisnt Delhi/Mumbai server. I requested him to visit again tomorrow in afternoon and perhaps at different location. During middle of meeting, this fellow stood up and walked out. I followed him to ask what happened? He misbehaved by saying “I heard enough, I am going. That’s all we can do”. I felt offended, I asked about his details, he denied giving by saying “Do whatever you can”. He left ignoring me. I feel bad as customer, and also because I have been a Tata employee. I had never expected, one of Tata companies would do such things i.e. poor service and worst customer support (not at phone, but at ground level – those visiting agents). I feel, I have wasted so many hours talking, thinking and complaining. No one wants to listen and do anything. June 24, 2011: I found Tata Photon very slow at my residence, hence filed a fresh complaint (requested that someone should visit me on Sunday at my residence to test speed in that area) via phone. CSR said, they don’t work on Sunday, I said – I can be available on weekdays provided an appointment is taken. Did you buy device with warranty? What speed do you get? I told them, “I am happy with the device but not with the signal and speed in this area (my residence), hence needed someone to visit me and test speed here”. They asked me to go to Tata Photon centre, around 8 kms from my place. I asked, “how can they test issues of this area in different area?”. They threw another bomb by saying, a fee( INR 75) needs to be paid by customer, if he/she wants technical-support-engineer to visit customer’s place? I got upset and reminded that this is mobile-broadband. Isn’t it their responsibility to make sure connection signal and quality is good in all areas? Anyway, that was new, I had not paid such fee earlier. I asked, when did they start charging? She said, “Yesterday”. I reminded her, I filed complaint day before yesterday. She said, it has been started on June 20, 2011. I asked her to pass the call to her senior, who ended up saying the same thing. I told them, the policy is ridiculous. Why a customer has to pay extra to get service related issues checked/fixed? Isn’t customer already paying every month? Isn’t it Tata’s responsibility to provide services as they promise? I have invested some money and time to get the device and connection; I can switch to different provider, but device might not be reusable unless someone buys it from me. Once again, I am disappointed by Tata Tele’s services. I am going to move away from them and would not recommend Tata Tele’s services to my family and friends. June 28, 2011: As an last attempt, I wrote an email to Tata Tele Services contact and also copied the same to UP East Nodal Officer. June 29, 2011: I got a call from a senior Engineer, who visited me on the same day. During 3-4 hours long troubleshooting, he figured out the reason behind slow speed, which is, HSIA signals was not as strong as CDMA 1X, and some tower issues.He got an antenna installed, on the roof-top, and connected to my USB device. He promised to get a repeater installed during weekend, so that all devices at our place can get better quality signals. Once antenna was installed, and some augmentation was done in one of the towers, things improved a bit. Once again, I gave my feedback about service and the misbehaviour by one of their peers. I am sure, the good-guys would fix things by putting peer pressure and leading by examples. As far as fee for visit is concerned, I was told by one of the engineers, it is for the cases where customer’s device or computer is found to be faulty, not the service. I wonder, why I was not told the same earlier during the call, which made me upset? I am going to wait for couple of days. If I get consistently better quality speed, I would strike out the line (about not recommending) above. Anyways, there are some issues with Tata Photon+ customer support and service, which would need to fix, so that all issues can be resolved without any escalation. Tip: Choose HSIA from network-settings of Tata Photon+ dialer, this would force modem to use to HSIA enabled towers/frequencies and would avoid using CDMA 1X. This entry was posted in Broadband, General, India, Kanpur and tagged broadband, customer, evdo, India, kanpur, latency, mobile, photon, services, speed, speedtest, support, tata, tataphoton on June 7, 2011 by Abdul Qabiz. Entrepreneurship Cell (E-Cell), at IIT Kanpur, is organising TEDxIITKanpur event on March 12, 2011. This is the first event of it’s kind, and I hope we would have more of those (TEDx, BarCamp, DevCamp, etc.) in Kanpur (within IITK campus or outside). Our company (Allies Interactive Services) is honoured to contribute as design sponsor of TEDxIITKanpur, and hopefully other events organized by E-Cell, IIT Kanpur. This entry was posted in Entrepreneurship, India, Kanpur, News and Information and tagged 2011, allies, alliesinteractive, ecell, ecelliitk, Entrepreneurship, event, iitk, iitkanpur, kanpur, sponsor, ted, tedx on February 28, 2011 by Abdul Qabiz. Entrepreneurship Cell (E-Cell) team at IIT Kanpur invited me to talk about “idea to business-plan” to some students (budding entrepreneurs). I ended up speaking about different things, hopefully I covered what they were looking for. I mostly iterated what successful leaders, entrepreneurs and businessman have shared over the years. an entrepreneur is seen as half-naked guy who is dancing alone, different from crowd, in Indian society. there would be skeptics but don’t worry about that. Freemium: business model. why freemium works? examples: google-apps, e-books, etc. challenges: getting ideas executed, getting customers, getting a good team, getting a good accountant, etc. After session, couple of teams discussed their ideas with me and wanted my thoughts. I shared what I knew, hope I could be of some help. Thanks to entire IITK E-Cell team for inviting and giving me an opportunity to share some of things I know. It feels great to give back. I already know, I need to get better speaking on stage. With every opportunity and effort, I am getting better. Hopefully, I can engage audience and be entertaining in coming years. This entry was posted in Entrepreneurship, Kanpur, Places and tagged ecell, entrepreneur, Entrepreneurship, iit, iitk, kanpur, session, talk on September 26, 2010 by Abdul Qabiz. Paul Graham wrote a nice essay titled “Cities and Ambition”. When I read it, I had already returned to Kanpur (my hometown), I took the essay in slightly different manner i.e. I challenged it and motivated myself by thinking, I can do great stuff from this city. Just after one year or little more, I am in agreement with that essay. I realize, how a good city (and people there) matter in whatever you do. At work, I ended spending most of time dealing with personnel issues and trying to mentor about obvious things (in development and programming). Outside of work, I don’t feel like going out anywhere, not even walking on streets. I just don’t like the attitude, psyche and habits of people here. I have, slowly, stopped doing all activities – photography, bike-rides, blogging, participation-in-events, exercising, etc. I am trying to understand the reason, I imagine it could be because of lack of motivation or I am too busy trying to do a few things. Another important thing, it doesn’t matter, who is holding what position, or how much rich one is, or what is someone’s background – most of them don’t know the basic etiquette and manners (traffic, talking, respecting, eating, etc). Everyone appears to be selfish, who just cares about himself and his things (house, car, job, etc). No one bothers to care about other people and city. I don’t know, I can change others but I have kept myself the way I have been i.e. I still avoid throwing garbage on streets, spitting anywhere and doing other bad things, so common here in Kanpur. Unfortunately, children inherit these bad habits/values from their elders, and are not able to figure out that most of inherited values are not good. The worst thing in this city is the kind of attention a girl/woman gets from males (from 7 yrs to 80+ yrs). It’s weird to see the bad treatment given by males to females almost anywhere (roads, shops, cafe, etc). One could easily notice these things. Hard to imagine, how much a female-of-kanpur has to go through and tolerate. It’s sad, but true, today whatever Kanpur is because of it’s people. I am not complaining here; I am just writing what I notice – Kanpur is not a good city. It could have been better or remained better (as it was some decades back), if people were better. We (Kanpurites) deserve whatever (bad culture, bad public infrastructure, etc) we have now. The day, we start changing our attitude and habits, we would see the change. Meanwhile, I am going to work hard to be what I am, if I can’t get better. Things said above, are trying hard to change me, directly and indirectly. Each and every moment of the day remind me of my ambition and vision, I would not let anything stop me from doing it. If It takes me to move out of the city, I am now ready to do that too. This entry was posted in Kanpur, Places and tagged ambination, cities, culture, essay, experience, kanpur, paulgraham, Places on April 8, 2010 by Abdul Qabiz.